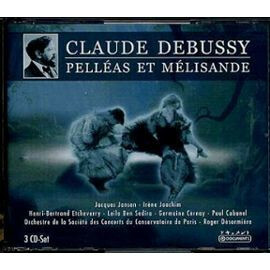 Does anyone know what is the best CD transfer of Desormière's recording of Pelléas? I've just noticed there is a bargain issue on Documents, which seems to be a derivative of Membran. Has anyone heard it? There's also a Pristine version, but, like many of their tranfers, it's had some conflicting reviews. Last edited by GregMitchell; Jan-31-2019 at 16:30. I used to have the EMI and got the Pristine last year; the Pristine is incomparably better. Last edited by howlingfantods; Jan-31-2019 at 19:21. I concur, the Pristine is the one to go for. Beautiful remaster. Another vote for Pristine. It's the best transfer, no question about it. I like Pristine transfer too. More sonic details revealed and polished. This is my reference recording of the work (I owned 12! ), with Inghelbrecht/Danco/Maurane/Etcheverry and Ansermet/Danco/Mollet/Rehfuss come close. I think the three leads in Desormière's are still unsurpassed. The prime Jansen is the youthful and ardent Pelleas. He himself couldn't replicate the success when trying again 15 years later in another studio recording. While there are ladies with more memorable voices (Danco, de los Angeles, von Stade), none could match the portray of Irene Joachim with her haunting frailty and melancholy. One can feel that the ambiguity of Melisande's character came from within, not acted: she flips effortlessly from childish playfulness to womanly sadness in a matter of a few words (Desomiere's quicksilver conducting helps too). Etcheverry manages to stay violent but with refined tension, not as banal as other less stylish baritones. Anyways, I love this recording so much that I have been OK with any lesser transfers than the Pristine. Last edited by silentio; Feb-04-2019 at 07:28. "Désormière's La mer again; shall I ever tire of listening to it, of contemplating it, and breathing its atmosphere? And each time is like the first time! An enigma, a miracle of natural reproduction; no, even more than that, sheer magic!"